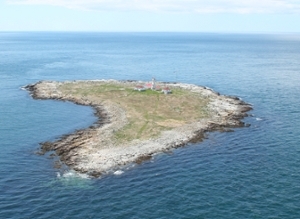 Seabird research on Machias Seal Island is directed towards measuring and understanding the responses of seabirds to changes in the marine environment. We do this through intensive long-term study of the diet and demographics of a community of four species (Arctic and common terns Sterna paradisaea and S. hirundo, Atlantic puffin Fratercula arctica, and razorbill Alca torda) exploiting different parts of the oceanic food-web. Our study site is a small (9.5ha) island situated at the junction between the cold Bay of Fundy and the warmer Gulf of Maine, where changes in the oceanic system are likely to be manifest sooner than at sites situated more centrally in marine ecozones. Three of the four species of seabird (puffin, razorbill, arctic tern) are at or close to the southern edge of their breeding range, whereas common terns extend for thousands of kilometers south and north; the site is therefore well placed to detect large-scale climatic or oceanographic changes that would be expected to affect these species differently. Our research and monitoring protocols are consistent with those used by seabird researchers elsewhere in the Gulf of Maine, coordinated by the Gulf of Maine Seabird Working Group. Our crew of two or three students arrives on the island in early-to-mid May each year and sets up in one of the two Canadian Coastguard houses there. They remain until mid-August when all or most of the seabirds we study have left for their winter quarters. We collaborate with the Canadian Wildlife Service staff member who oversees tourist activity on the Migratory Bird Sanctuary in June and July, and with the Coastguard staff who keep the light throughout the year. Many of our data are collected by observation from blinds situated strategically around the island; we also check nests for breeding activity, band birds, and collect diet samples regularly throughout the summer. This study began in 1995, supported by the Canadian Wildlife Service of Environment Canada and the Natural Sciences and Engineering Research Council of Canada through the former ACWERN (Atlantic Cooperative Wildlife Ecology Research Network) at the University of New Brunswick, and has continued uninterrupted since. Our first few years’ results were described in a paper in 2003 (Diamond & Devlin 2003) and there have been many student theses and scientific papers published from our work.